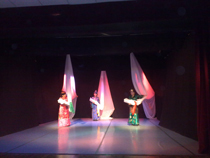 The show “Kys-Khalyyr”, a diploma production of the students of Tuvan Studio of GSII (State Specialized Institute of Arts), was recently presented to the Muscovites. It is an idea-project thought out by Galina Dorzhu, based on Tuvan legends, traditions and customs hundreds of years old. Galina Dorzhu is one of the graduates of well-known Tuvan group “Shchuka”, which gave many famous talented artists to Tuva; she now is an instructor at the GSII in acting and stage speech. Institute of archeology and ethnography of SO RAN excavations were instrumental in the discovery of a new type of early human not known before, who inhabited the territory of Altai Krai about 30-40 thousand years ago, at the same time with Neanderthals and people of modern physical type, as announced by the communications department of SO RAN to Academ.info. 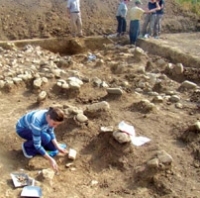 This extremely significant find was made during quite ordinary circumstances, as the leader of the excavations, vice-director of IAET SO RAN in science, Doctor of historical sciences, Mikhail Shunkov, explained. Rescuers found the body of the shepherd who was buried by the avalanche in Mongun-Taiga district in Tuva on March 20. The search, performed manually, took two days. On March 25, at 14:40 in local time, the body of the herdsman Khaaya Omudan was dug out from under a 1.5 meter layer of compressed snow. The body was extracted after the arrival of public prosecutor’s deputy, and released to family members yesterday. Today marks 65 years since the day when the legendary tank driver, Khomushku Namgaevich Churgui-ool received the title of Hero of the Soviet Union. At the time of victory, he was near Prague, after the war he worked in Tes-Khem kozhuun, in the village of Bert-Dag. He was selected as a delegate to the Supreme Soviet of USSR, and has done much for the village which had become his home. He died in 1978. In the border village Bert-Dag, a monument was raised to the Hero. Today, his compatriots will put a wreath there. 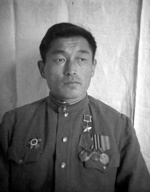 The native of Barun-Khemchik kozhuun, Khomushku Churgui-ool, went to the front as one of the first group of volunteers of TNR. These citizens of Tuva wento pay the international debt: Baikara Biche-ool, Kyrgys Idam, Kongar Tyulyush, Oyun Bartyi-ool, Ondar Dyrtyk, Tyulyush Nursat, Tyulyush Kyzyl-Tac, Tyulyush Shaidun, Tyulyush Uinuk-ool, Khomushku Churgui-ool, and Khovalyg Saiyn-ool. 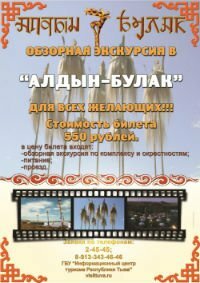 Today, as part of the cinematic festival “Kinematograficheskii Chekhov” , in the “Klassika” hall (Ezenshtein Library, Moscow), National Artist of SSSR Yuri Solomin and other participants of the film team will introduce the film “Dersu Uzala”(Mosfilm 1975), based on the writer and traveler Vladimir Arseniev’s book of the same name. The film showing is dedicated to the 100th anniversary of the great Japanese film director Akira Kurosawa. 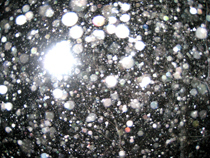 Squall winds with snow covered the republic late at night of March 18. The wind speed reached storm condition at times, and the snowfall was so strong, that visibility on highways was under 5 meters. Drivers simply could not continue driving and had to stop and get off the roads. In the conditions of disaster power outage in Kyzyl, the lights remained on only in some sections of Chuldum Street, where the lights are powered by solar batteries. As the meteorology center of Tuva announced, the snowfall during these 24 hours was about equal to a full month’s amount. 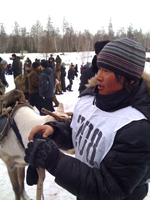 Adygzhy Sambuu from Adyr-Kezhig village became a double champion of the 16th reindeer herders’ festival which just took place in Todzha kozhuun. He was able to saddle and load a reindeer faster than anybody else, and was first in the main competition – reindeer races. The events in the last type of competition evolved dramatically – out of the eight reindeer riders who started, only four finished the race. Half of the animals simply outright refused to go in the direction of the finish line. The last meters of the finish stretch became very alarming for Adygzhy, who was the first to get there. His reindeer suddenly made a sharp left turn, and kept going practically parallel to the finish line. The other riders began to catch up to him. During the past two months, I had the good fortune to meet and to get to know a huge number of people, different in age and in character, in their profession and in their relationship to life in general. All of them had one thing in common – their participation in the special project “Nine Treasures”, which started on January 13 of this year. Within the Russian House of Science and Culture in Berlin, a great venue for presenting Russian regions to Germany’s capital, the European tour of the Republic of Tuva made a two-day stop on March 15 and 16 to give us a glance into the exotic culture of the very center of Asia – in 2010, the “Year of Tourism” of Tuva.